Shamshad Hussain - its all in the genes! "People... are art in motion, an ever changing landscape of a cosmic drama." "There's despair and hope running through my canvasses"
It is hardly surprising that it took Shamshad Hussain over 40 years to emerge from the shadows of his father - the celebrity artist M.F. Hussain. One of the very few who have managed to make a name in a field dominated by a father, Shamshad has defied the odds to struggle and emerge as one of the pioneers of contemporary art in India. Born in 1946, Shamshad spent most of his childhood in Mumbai with his father. His love affair with the brush began at the age of nine and the passion is still unspent. Shamshad studied at the College of Fine Arts in Baroda. He later went to the Royal College of Art, London and came back a totally rejuvenated man. "That trip changed my perspective about art", he says. In London, he says, he discovered a sense of form. And almost all his paintings since then have displayed a maturity seldom found these days. The world of art soon came to acknowledge it. He held his first solo show in 1968 and in 1983 he won the Lalit Kala Akademi's National award. His success has propelled him to the forefront of modern Indian art and he has held exhibitions in different parts of the world including the Biennales of Tokyo, Dhaka, Ankara and Bhopal. 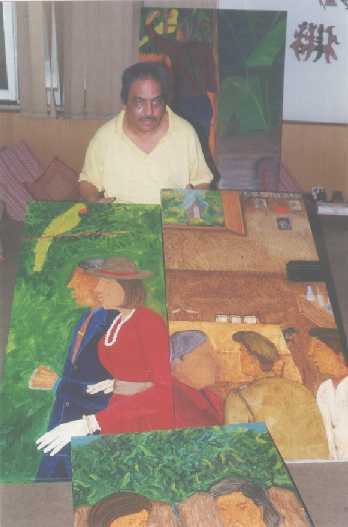 Today, Shamshad's works sell as soon as he can paint them. And the art world looks up in anticipation whenever he announces an exhibition. His latest body of work was titled Love In The Time of Cholera. " Its one of my most significant series. There's despair and hope running through my canvasses....."
IDM: You are a well known artist and also the son of M.F.Hussain. Is it an advantage or a disadvantage having such a famous father in the same field? SH: First of all, I am not a famous artist. My father is. I still consider myself a struggling artist. Having a celebrity father has its advantages in that people recognise you as the son of M.F. Hussain. But there is a big disadvantage as well - as many people keep comparing my works with my father's. They don't see me beyond my father. IDM: Critics say that some of your works are very close to your father's. Do you take this as criticism or a compliment. SH: In my present works there is no influence of M.F.Hussain. I agree that he inspired me in my earlier works as far as space and colours were concerned. But once I went to London's Royal College of Art in 1978/ 79, I became conscious of my own identity as an artist and started charting out my own style and destiny. IDM: Who is your mentor in life? IDM: Did your father advise you when you were starting off as an artist? SH: He told me that this is a tough world and I would have to work very hard and "..only then you will reap the fruits of your labour". That's an advice I have always tried to follow. IDM: Have you found your quest in art rewarding? SH: As I said earlier I still consider myself a struggling artist. I have been experimenting with various ideas and it has been a journey into the unknown. But I have never gone back and have always tried to move ahead. IDM: What do you enjoy painting the most? SH: People. In every corner of the world you find people of different hues and sizes. That's art in motion, an ever changing landscape of a cosmic drama. IDM: You have described your new series Love In The Time of Cholera as your most significant. Can you tell us something about it? SH: My series Love In The Time of Cholera is based on Gabriel Garcia Marquez's book of the same name. The story deals with romance and tragedy. It is a story of a doctor who saves as many people as he can from an epidemic of cholera. My work depicts this fascinating theme, which makes a very strong statement about the effect of pollution and degradation of environment. IDM: For many years now you have been depicting nature in your works. Does your work reflect the deterioration of environment? SH: Artists cannot divorce themselves from their surroundings. Apart from mine, the impact of environment is reflected in the works of Manjit Bawa, Arpana Caur, Manu Parekh, Anjali Ela Menon and others who have all focused consciously or unconsciously on the changing environment. IDM: How has it affected your work? SH: In my works the deterioration of environment can be seen in the colours I use. Previously I used more of greens but now I use browns, grays and blacks. That's my way of depicting the terrible effect of pollution upon our lives. When I came to Delhi in 1961, the air was clean and there was greenery all around. During those years I also spent a lot of time travelling through forests of Madhya Pradesh - and green and yellow dominated my works then. It was in the mid seventies, that the environment started degenerating. Delhi's population began increasing with the influx of migrants from small towns and villages. Suddenly there was a rush of cars on the roads. Buildings began sprouting where there was greenery earlier. Delhi became a concrete jungle. That was when dark hues started becoming prominent in my paintings. I began using browns for the rivers depicting muddy water and grays in the atmosphere signifying the haze of pollution. IDM: Should artists depict only the dark reality? What about the brighter side of life? SH: Art should depict both - reality as well as evoke optimism for the future. I agree an increasing number of artists depict only gloominess, agony and destruction. As far as I am concerned there is a ray of hope even in my most sombre paintings. Hope is the integral part of my new series Love in The Time of Cholera.